Our retail management software solution is designed to give the high level of solutions to Independent textile stores, Retailers and Multi Store Retail chain. With updated technologies and complete hardware integration our garments billing software in Chennai provides a seamless shopping experience for customers. With control on inventory and point-of-sale, our software is designed to make retail management so easy & ensures focused business. 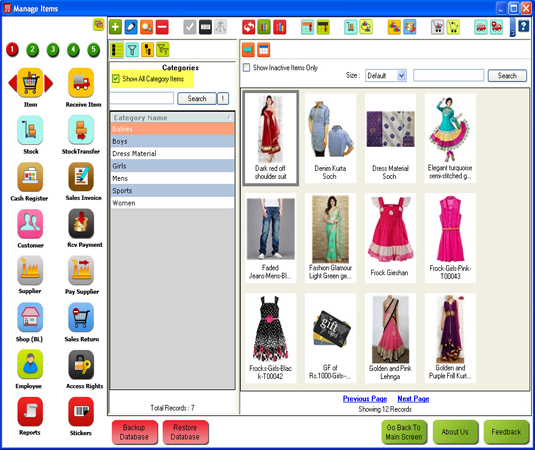 Our garments billing software in Chennai is a one-stop solution loaded with sharp features such as unique bar coding, quick stock taking with PDA. It aids in analyzing customer's buying behavior, rapid liquidation of non-moving stocks, calculation of landing costs to fix margins, filing of VAT returns & e-filing, etc.